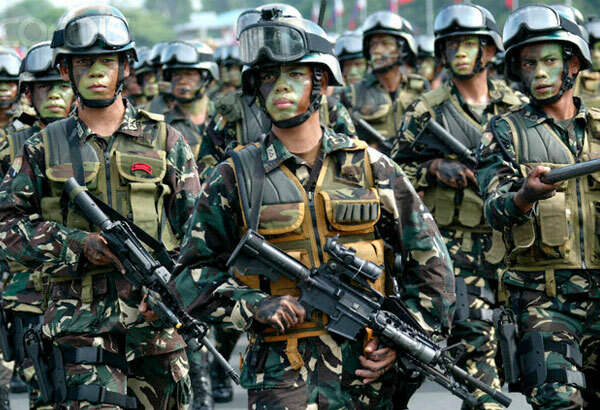 MANILA, July 25 -- The Armed Forces of the Philippines (AFP) said it strongly appreciates President Rodrigo Duterte's pledge to recruit more troops and acquire more weapons to help them fulfill their mandate of defending the country against all forms of threat. "The AFP fully appreciates the efforts of the Commander-in-Chief to strengthen our capabilities and add more to our ranks so we can accomplish our mandate better," AFP spokesperson Brig. Gen. Restituto Padilla said in a message to PNA Tuesday. During a press conference after his second State of the Nation Address (SONA) Monday, the Chief Executive said he is pushing for the recruitment of 20,000 soldiers and 10,000 to 15,000 Special Action Force members for the Philippine National Police counter threats like insurgency and terrorism which threatening to make a foothold in the country. As of this posting, the entire AFP, consisting of the Army, Navy and Air Force, consist of merely 125,000 officers and enlisted personnel. Aside from additional troops, Duterte said he is planning to acquire all the needed weapons and equipment as to further strengthen the AFP in its security role. "Right at the very start of his tenure, the CinC (referring to President Duterte as Commander in Chief) assured the AFP that 'he has our back.' He has shown this many times and continues to do so this very day. He was on countless occasions genuinely shown his concern for our wounded and heroes and the families left behind," Padilla added. Aside from additional troops and equipment, Duterte also vowed to provide for the families of troops wounded or killed in the line of battle. Assistance are in the form of shelter, health care, education and employment.